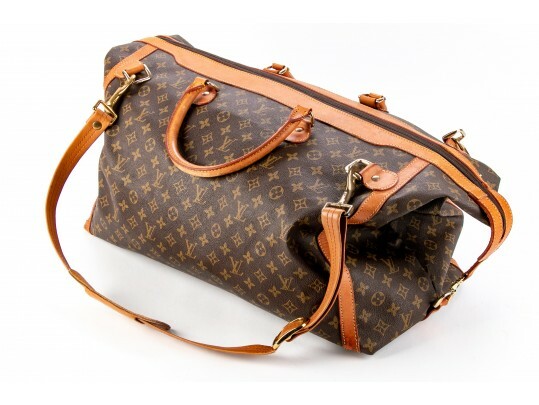 Louis Vuitton vintage duffle bag with central zipper closure, two handles, shoulder strap, front with two exterior zipper compartments, the top with four brass buckles to which the shoulder strap is attached. Louis Vuitton leather label that reads: Louis Vuitton, Paris, Made in France.the underside with five goldtone feet. The interior with one large opening and one interior side zippered compartment, leather label below that reads as above. Stitches loose to two tabs at back buckles, 1/4" tear to shoulder strap at buckle, slight soiling to leather from wear and handling, beginning of tear to strap that connects zipper to bottom, has lock - no key. Wear consistent with age and use.